Taapsee Pannu has never been afraid to take on a challenge, especially one that involves some physical action. Whether it is her role as an agent in Naam Shabana or in Baby she aces her action sequences no matter which film. The Pink actress has taken on a new role, this time in a short film called Nitishastra. The film is directed by Kapil Verma and stars Vicky Arora as well. The film was part of the ‘Large Short Films’ screening that is released every year by Royal Stag. In this debut, not only is Taapsee Pannu playing a fantastic character but also packs a few powerful punches in the film, literally. The film has some of the best action sequences ever seen on screen. To add to the brilliance, the action sequences were directed and planned by Tinu Verma, the veteran action and stunt director who also happens to be the director’s father. Taapsee, who has done action in the past, aced the stunts and action scenes and was delighted to have the help and direction from one of the best stunt masters in the industry. When asked about how it was to shoot that scene, she said, “I had done action before but Tinu Sir insisted that this will be different and aggressive and it surely was,”. “He is a very experienced professional and working with him was sheer delight. His confidence in me and the patience with which he made sure I learnt each n every move perfectly was really helpful in pulling off these sequences. 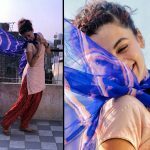 I am really enjoying the feedback I am getting for the film.” We cannot wait to see Taapsee in more diverse roles, hopefully with a few action scenes in them, as they are a sight to behold. Taapsee has two back to back releases in July. One a hockey biopic on Sandeep Singh called Soorma along with Diljit Dosanjh on 13th July and the other is Anubhav Sinha’s Mulk in which she will be playing a lawyer, the film also stars Rishi Kapoor, Prateik Babbar and Rajat Kapoor and will hit the screens on 27th July 2018.